UK Scientists at the University of Southampton have developed a technology to store and retrieve data on crystalline disks using lasers. The stable structure of the crystals open up the possibility of uncorrupted storage for billions of years. The small disks are very durable, capable of withstanding up to 1000C temperatures and estimated to last 13.8 billion years at 190 celsius. 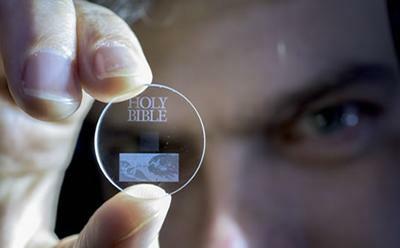 Documents of historical importance such as the Magna Carta, King James Bible, and Newton's Opticks have already been saved and could survive the human race using this technology. The process used to encode the data is known as 5D, or five dimensional, data. The encoding uses nanostructures and the associated length, width, height, orientation and position to store data. The 5D encoding allows each disc to store up to 360 terabytes of data. Powerful laser pulses set the data into the fused quartz with can then be read with an optical microscope and polarizer. The researchers showcased their findings at this month's San Francisco's SPIE (international society for optics and photonics) conference and look to bring in industry partners to develop and commercialize the product.